March Madness! The AFB Comment Contest for March 2011! First off, thanks to everyone who commented on last month’s blog posts! Congratulations to dj jimenez for being our randomly selected winner! My random number generator at Random.org has yet to choose repeat winner in all the time the contest has been going! Very clever! Once we hear from dj (you can contact me through the AFB Forum - send a message to "Andy"), his choice of either the DC Universe Classics Wave 16 Robin figure from Mattel or the Yellow Eternal Dalek figure from Character Options will be on the way when available from Mike’s Comics N’ Stuff. Now to March’s Contest: on offer are two great prizes, either the DC Direct Arkham Asylum Series 1 Joker & Scarface Two-Pack figures from DC Direct or the Uncanny X-Force Minimates set from Diamond Select - either of which would be a great prize! 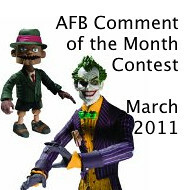 every genuine comment on a post from the calendar month will be eligible to receive the prize. 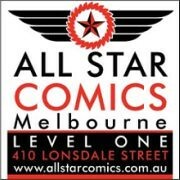 I’m going to stick to my own time zone and call it at 23:59:59 Australian Eastern Standard Time – best to comment often and comment early! if my super scientific randomizer comment selector system chooses an Anonymous comment, I’ll skip it and go again – you need to leave a name, a link, your AFB Forum username or email addy so that I can contact you if you are the winner. Blogger comments allows you to do this, as long as your profile is not set to private – check your settings. you will be given a choice of one of the two figures on offer from the month’s contest – figures will be in their original packaging. figures will be sent by first class mail within the US (Mike is sending them, remember) and first class international to any overseas winner. An overseas winner can elect to chip in for Priority Mail or Insurance, but otherwise we can’t take any responsibility for a parcel that doesn’t arrive – after all this is coming out of AFB’s not dreadfully deep pockets! 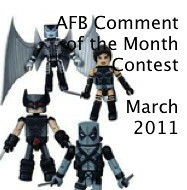 Once again, thanks to Mike for making this all possible for us, and here’s to another happy month of commenting! Cool, I know which prize I'll pick if I win! wow i cant believe i actually won. *sniff, i never thought it would actually happen to me! amazing! thanks a lot dude! !